Lung cancer is a leading cause of cancer with a poor prognosis. Bronchioloalveolar carcinoma (BAC) is a rare tumor that has always intrigued physicians. Since the last World Health Organization classification the pathology has been clarified; BAC per se is an adenocarcinoma with a pure bronchioloalveolar growth pattern and appears as an in situ alveolar adenocarcinoma. More usually BAC is a clinically recognizable entity presenting as multi-focal nodules evolving towards pneumonia associated with pulmonary shunting. Pathology is that of a multifocal mixed adenocarcinoma: bronchioloalveolar and papillar. Whatever the stage, survival is better than in other forms of non-small cell lung cancer (NSCLC). The true frequency of BAC is unknown, although it is a rare form of lung cancer; smoking cannot be excluded as a risk factor. It appears that p53 and ras genes are less often mutated than in other lung adenocarcinomas, suggesting that the cellular mechanisms involved are different. 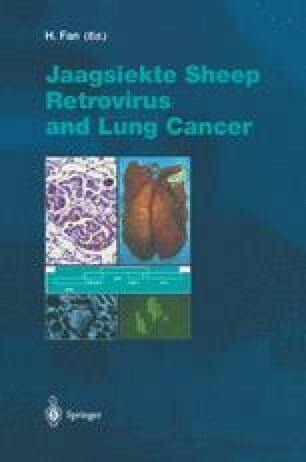 Ovine pulmonary adenocarcinoma (OPA) presents with the same symptoms as BAC in humans and is caused by a betaretrovirus — Jaagsiekte sheep retrovirus. Very early on, clinical and histological similarities with human BAC were stressed. A recent series of OPA described, according to the third edition of the WHO classification for human lung cancer, mixed adenocarcinoma, BAC and papillary and/or acinar carcinoma. An immunohistochemical study suggested that some human pulmonary tumors (including BAC) may be associated with a Jaagsiekte sheep retrovirus-related retrovirus, but so far no molecular study has confirmed this observation. Thus, OPA is an exquisite model of carcinogenesis for human lung adenocarcinomas.